Beans, beans, good for the heart, the more you eat the more you…. start your day off well with this power house recipe. He he! I know, I know, you’re probably thinking why do I need to make homemade baked beans when I can get some for 25p from the shop already made? Well, I can tell you truthfully that I thought exactly the same thing. That was until the day I had no beans in the cupboard to go with my cooked breakfast! (I was so sure I’d bought some??) Anyhoo, the point is I was not about to let the breakfast boat sail right past so I had to get creative and try and make my own. I am so glad that I did. 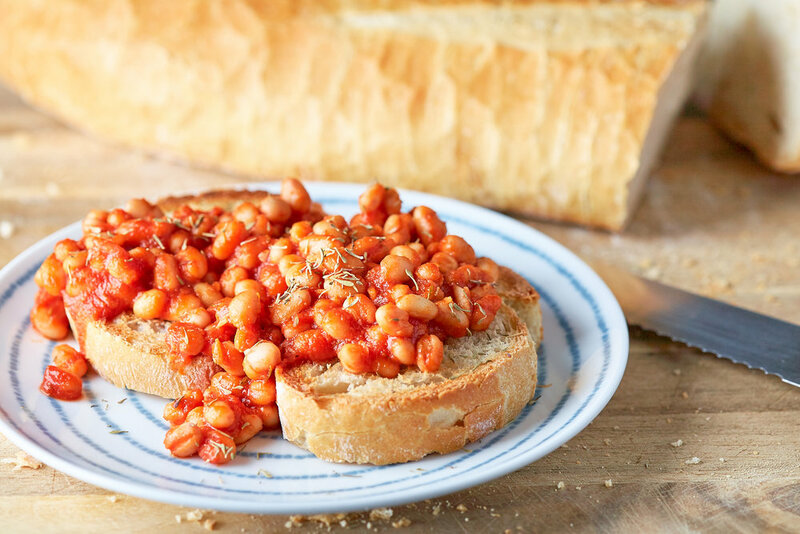 This baked bean recipe is so full of flavour. You can taste all of the individual ingredients and not just an overall sweet tomato taste. I was a little worried about what the kids were going to make of them but they both ate the whole lot! I highly recommend you dip your toe into the homemade bean bath and answer the question for yourself. You won’t be disappointed. I love how versatile you can make this recipe. By simply changing up the beans you can get a completely different nutrient content. We used the traditional haricot (navy) beans for this recipe as you can get around 50 mcg of iodine from a 3/4 cup portion. This is a really good source of iodine in a vegan diet (especially if you don’t like seaweed!) However, you could use any beans you prefer or add a selection of different beans. Aside from being super delicious, this recipe is a lot lower in sugar and salt than their shop bought cousins which can’t be a bad thing now can it? We love to have it with our scrambled tofu. Let me know your thoughts on the big bean debate. To make or not to make? That is the question. Voila! A very quick and nutritious meal to please all of the family. Serve on toast or as a side dish. We enjoy having ours with scrambled tofu.